The race was effectively over early when Nico's car failed. A battle had been warming up nicely too - Nico did not repeat his goof of last year's first turn, indeed on the contrary he firmly and professionally rebuffed Lewis's attack and indeed it was his team mate who was the one who ran off the road. But almost immediately Nico reported on the radio that his "throttle pedal is broken", that it was staying on full noise even after he lifted his foot and the like. For a lap or two it looked like something manageable perhaps as Nico kept up a reasonable pace in the lead. But as Ernest Hemingway said of bankruptcy this problem struck gradually, then suddenly. Come lap 7 Nico could hardly slow down for corners, several rivals flashed past and Nico gingerly headed for the pits at the lap's end. His day was over, so effectively were whatever lingering remnants of hope he had for the championship. "It's unbelievable that something like this has to happen" he said, clearly ruefully. From then on it was a Russian stroll for Lewis, managing his tyres and everything else with a comfortable gap to the rest, occasionally blitzing in with a fast time as if to say 'don't even think about it' to whoever was next up. Sure enough he was still in his imperious place at the end. He was late on told not to use DRS due to a rear wing problem, but it was the most minor impediment. Once again everything, somehow, had come his way. Lewis too regretted Nico dropping out. "I was excited as we were quite close together at the beginning" he said later, "and I was thinking 'OK, we've got a race here'. For sure it's a shame for the team to have lost one of the cars, and to not have a race..."
He maintained however that it wasn't as easy as perhaps he made it look to the rest of us. "Even though you're out front it's still a hard race" he insisted, "just staying focussed, staying in the zone all the time, there's so many opportunities to make mistakes...Just keeping on point, every time Sebastian picks up the pace just making sure you're answering to that speed, so I felt like it was a massive challenge." That he's now got a few fingers on this year's championship, with an opportunity to grasp it properly in the next round, seemed a surprise to him too. He did admit though that "this is the best position I've ever been in my career...today may have not been the most exciting day, but you have to take it when you do have it". Despite this, and despite the parallels with 12 months ago in Sochi particularly during a tepid mid-part of today's race, the fare more generally did have a bit more going for it this time. Particularly in the form of a couple of safety car periods which not only headed off the fuel saving that would otherwise been all-encompassing but also that the second safety car period, brought about by a big smash for Romain Grosjean which thankfully he stepped away from (though as he pointed out "I won't be able to run a marathon right now"), came at a tantalising moment. What Geoffrey Boycott might call a corridor of uncertainty - not quite close enough to the end to run that distance on a single set of tyres with comfort, but maybe worth a roll of the dice. 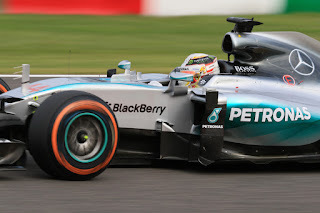 As it was neither Lewis, the Ferraris nor Valtteri Bottas in the first four places seized the opportunity but Sergio Perez did, as did Daniel Ricciardo and others. It meant that once Bottas and Kimi Raikkonen pitted they had some overtaking to do. And in that happy way that happens sometimes the two approaches somehow converged at the end. 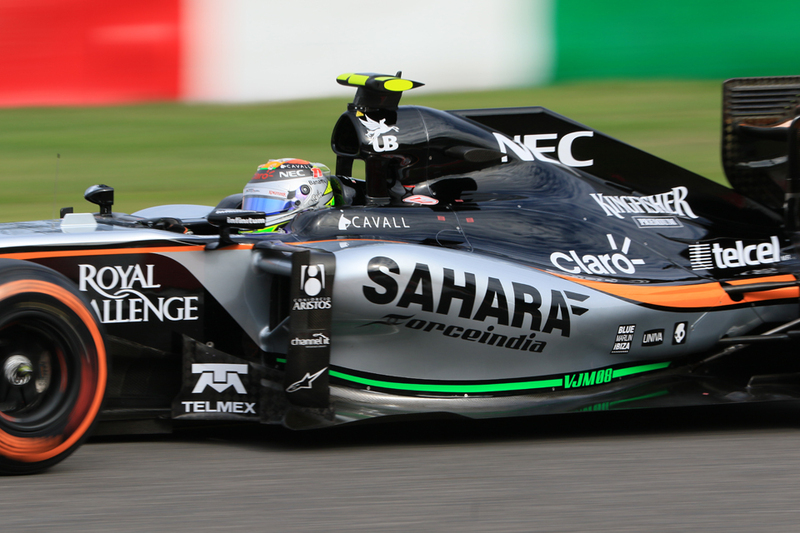 Indeed Perez held third place until the penultimate lap; Ricciardo meanwhile ceded the places slightly before, and had to stop before the end with a suspension problem. Officially today the latest constructors' crown dropped for Merc. That had been effectively beyond doubt for months of course but in the time-honoured F1 way it was tilted to them definitively by the stroke of a stewards' pen post hoc. Raikkonen crossed the line fifth today which in itself would have been enough to keep the matter still open but he'd done so after a last lap collision with Bottas as they disputed third place in the final breaths, having both just passed Perez. Kimi had just been told it was now or never to claim a podium slot, and it appears he took the instruction a bit too literally. Bottas was punted out and his podium finish for a fine drive was suddenly gone. 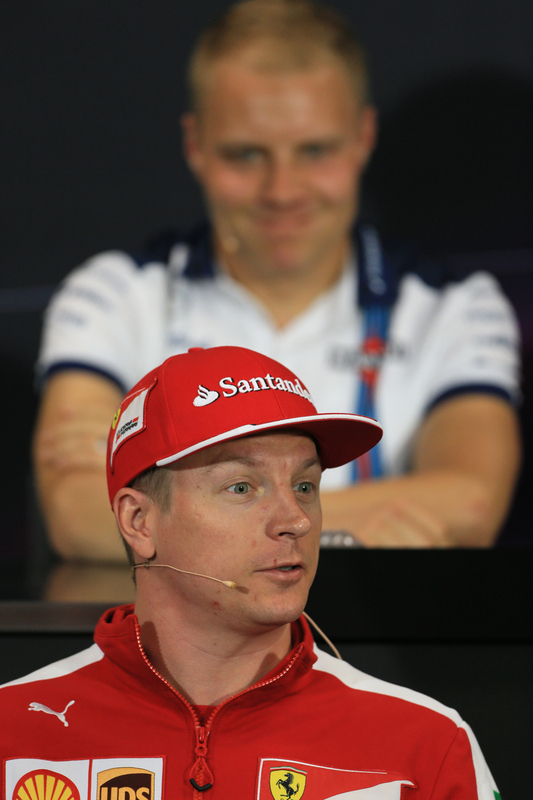 Kimi simply had speared into the side of his compatriot and the blame was all his. The stewards agreed and gave him a 30 second penalty and with this P5 became P8. It in turn meant that Mercedes's constructors' title was a done deal. Its odd confirmation should not however diminish how deserved it is. As Bottas and Rob Smedley pointed out too with justification however, the penalty makes no difference to them, the real victims. This all gave Perez back the third place he'd held for so long. 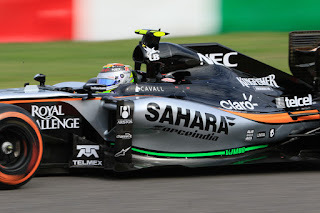 He's indeed been in excellent form lately, and today benefited both from the bold Force India pit call - the sort of courageous one often seen from the Silverstone team - as well as a stretched out stint on a single set of tyres has long seemed quite his thing. The unusual face on the podium is welcome too. "I'm just so happy; so proud of my team" beamed Checo. "Today it was just a phenomenal race; when we decided to box and we had 40 laps left on those tyres it was a tough call...we were so close to making it onto the podium but at the same time we were so close to retire the car because if I have a flat spot at that point which was easy to have because I had very little rubber on the tyres, it could have been a disaster but it went well. "When I lost a position to Valtteri I was so hard on myself on corner 14, but then on corner 15 I just said to myself 'you know Checo you have done a tremendous race, go home and bring the fifth place because you've done an amazing race', but then when it came back it was just something very special". 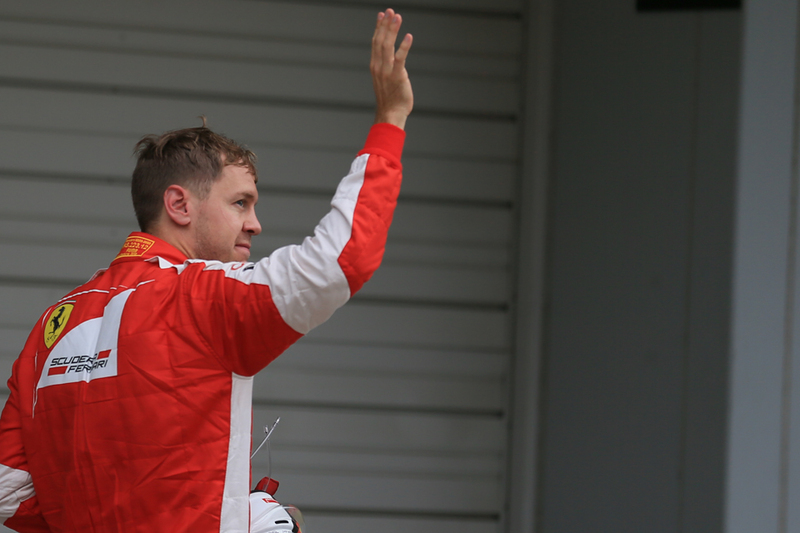 Vettel also performed what is quite his thing, by rising forward on race day to maximise his result. 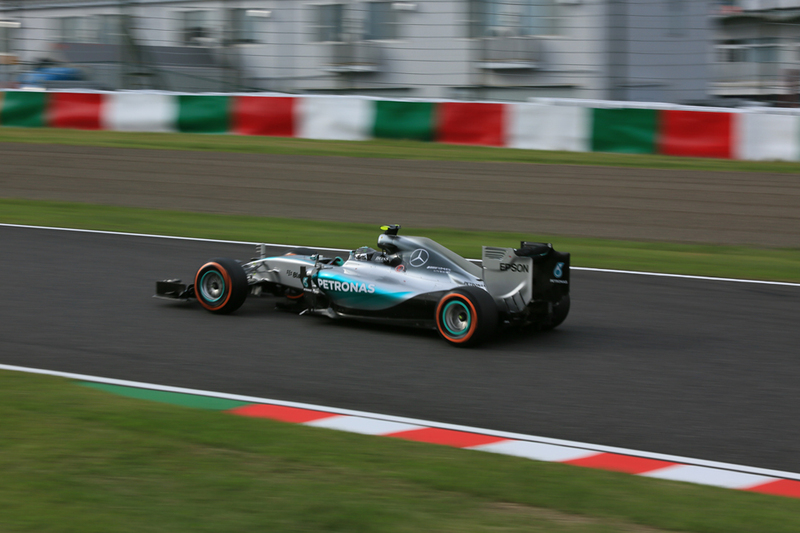 Although he was fifth behind his team mate Kimi from the off he showed himself to be the quickest of the non-Mercs, and after passing Kimi at a safety car restart he then cleared Bottas at the solitary pit halt by stopping later (Bottas was compromised in traffic after his own stop) and was aided on his way by a hardly credible 2.2 second turnaround. Vettel also emerged ahead of Ricciardo giving him just one car to clear which was that of Perez, which he did smartly. Lewis of course was out of reach but Seb still kept him honest. "I think it was a great stop but also a great strategy" said Seb later. "Then after the stop it was obviously very important to get past Sergio in the Force India, at the time I didn't know how important, but it was a good move to surprise him maybe in a place he didn't expect it. So overall, very happy, it was a great race, the car just came alive more and more as the race went on." Felipe Massa came through the carnage to claim fourth, which is an amazing result given he started in fifteenth - "I would have signed before the race, if you'd tell me I was going to finish fourth I would have signed straight away" said a contented Felipe afterwards. Local hero Danill Kvyat eventually was awarded fifth though was curious as to why he wasn't pitted at the safety car period as his team mate was. Next up was Felipe Nasr after a fine drive, saying his car "just got quicker and quicker" in the race, while Pastor Maldonado stayed out of mischief to get an eventual seventh. For a time it looked too that McLaren would get a double points finish as they ran in tandem with Jenson Button ahead to finish ninth and tenth. Later though Fernando Alonso lost his point to Max Verstappen, due to exceeding track limits and picking up a five second penalty. Not that Lewis needed to worry about track limits, penalties or anything else. He simply was on a plateau once again. And get ready for him to join the pantheon of three times F1 world champions. It was good to see Raikkonen go for that move on Bottas on the last lap, albeit it ended in a collision. It shows the Ferrari driver still has the passion and drive to win races and podiums. But you have to feel for Bottas as his solid drive deserved a podium. While I wish the move by Kimi hadn't ended in tears for both teams it was good to see some aggression from Kimi. Have thought that was lacking since his return to Ferrari. Hi both. As I said in the report I felt the fault of the collision was Kimi's, it was a definite misjudgement, though I found some of the shrieking reaction it against Kimi afterwards well over the top. After all it's not like Kimi makes a habit of driving into people, he's been known for years as just about the safest driver out there!